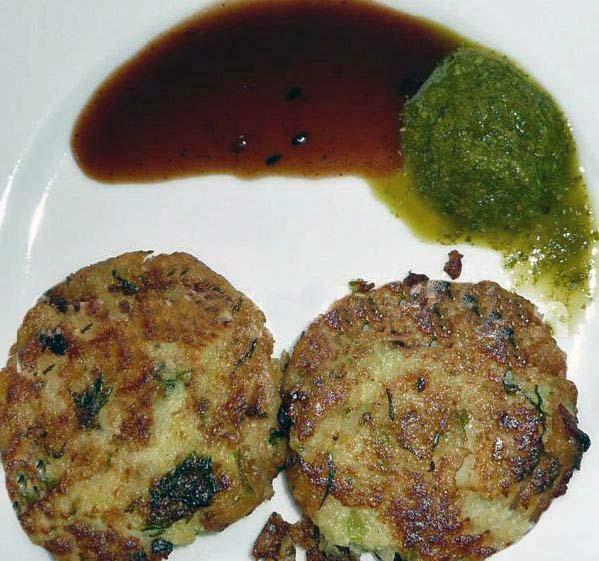 Aloo Tikki is one of the most popular of a group of hot and spicy snacks that are collectively known as Chaat Selection in India. You can see the Chaat wallahs or street hawkers, on the pavements of any busy shopping street on most evenings. They fry their fresh Aloo Tikkies on a hot griddle on a portable charcoal cooker known as 'Angeethi'. The wonderfully tempting aroma pulls hungry shoppers from far and wide. You can often see a queue of customers waiting patiently for their turn. If a chaat-wallah is any good, people travel fair distances to eat his chaat. The word chaat comes from a Hindi word chaatna that mean to lick. The chaat dishes are so good that people lick their plates, traditionally made of leaves held together with small sticks or twigs, used like paper pins, clean. Even now, disposable chaat plates and bowls are sometimes made from pressed Bunyan leaves. Banana leaves are also used for this purpose in some parts of India. These days however, most chaat wallas use disposable paper plates and bowl. Makes 10-12. 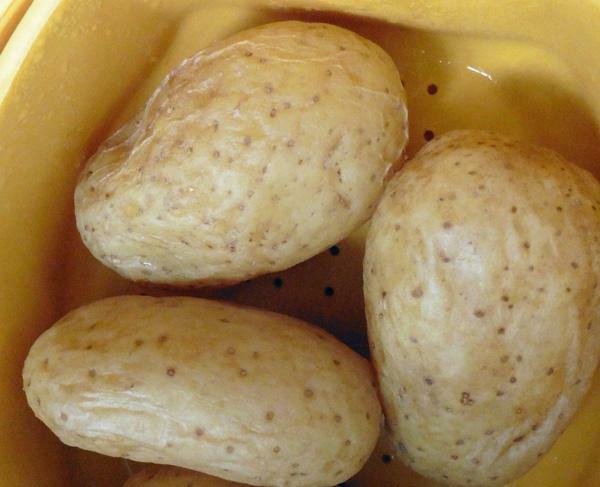 Boil potatoes in their skin, until soft. I cook them in pressure cooker for 4-5 minutes or microwave in a plastic bag, with 2-3 tbsp. water, for 8 minutes. Cool, peel and mash potatoes. You can grate them coarsely or mash them in a potato ricer. 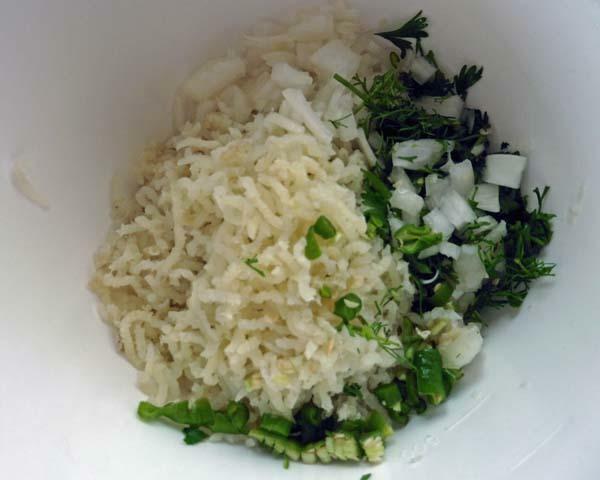 Chop finely onions, ginger, green chillies. 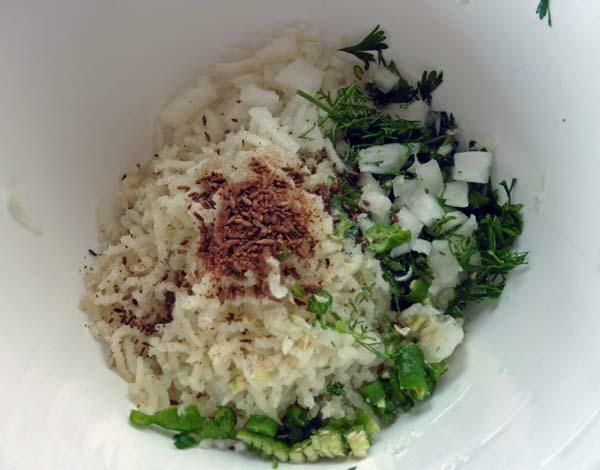 Add chopped coriander leaves, salt, garam masala and roast cumin powder to the boiled potatoes. With oiled hands, divide it into 10-12 equal portions, roll them into balls and then flatten them into 'tikki' or burger shapes. Potato chops can be made up to this stage and frozen. Just make sure that they are separated by wax paper or foil. Heat 2-3 tbsp. of oil in a heavy bottomed frying pan. I use a non-stick pan, and fry 3-4 tikkies at a time, on medium heat, until nicely brown and crisp on both side. You may need to add more oil for subsequent batches. they can be cooked up to this stage in advance. 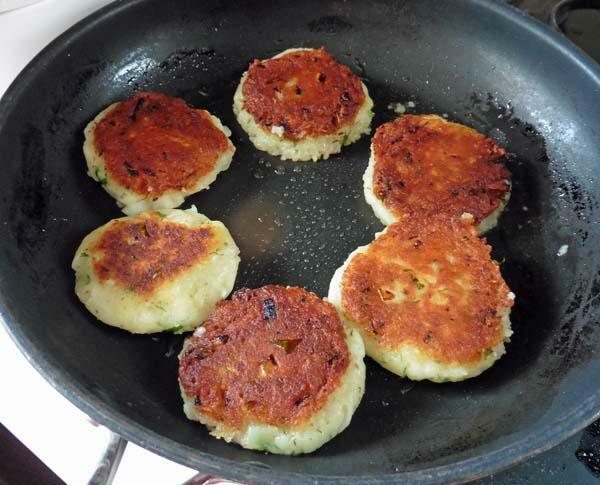 When ready to serve, press each tikki with a flat spatula, squashing it flatter and cook it a little more, so more of it's surface gets crisp. A finished and properly squashed tikki does not have smooth edge. Take out and place on absorbent paper. Serve hot, with Imli Chutney and Green Mango Chutney. 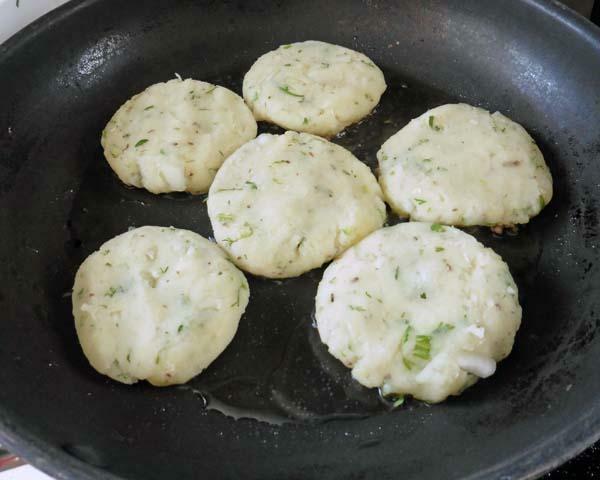 Another serving suggestionYou can make small tikkies, place them on a platter, top each with a tiny amount of finely chopped onions and tomatoes, then spoon 1 tsp. of Tamarind chutney on top and serve as finger food at a party. 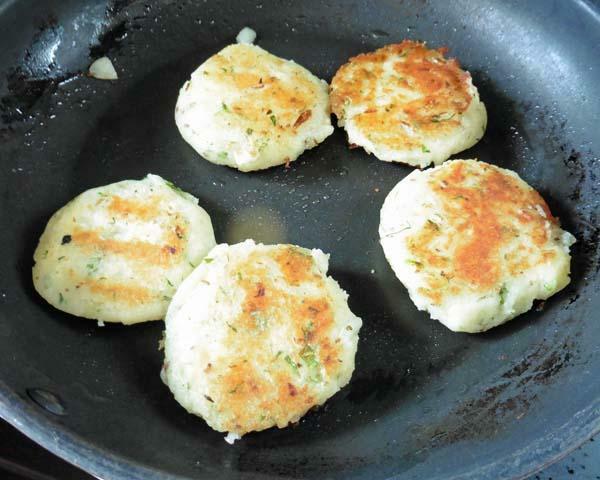 For crisper Tikkies, add 100 gm of arrowroot powder at step 5. Also see Semolina Puffs with Fire Water or Gole Gappa and Jal Jeera, another extremely popular chaat dish and Chat Selection.